Barbers Hill Eagles on Friday night. 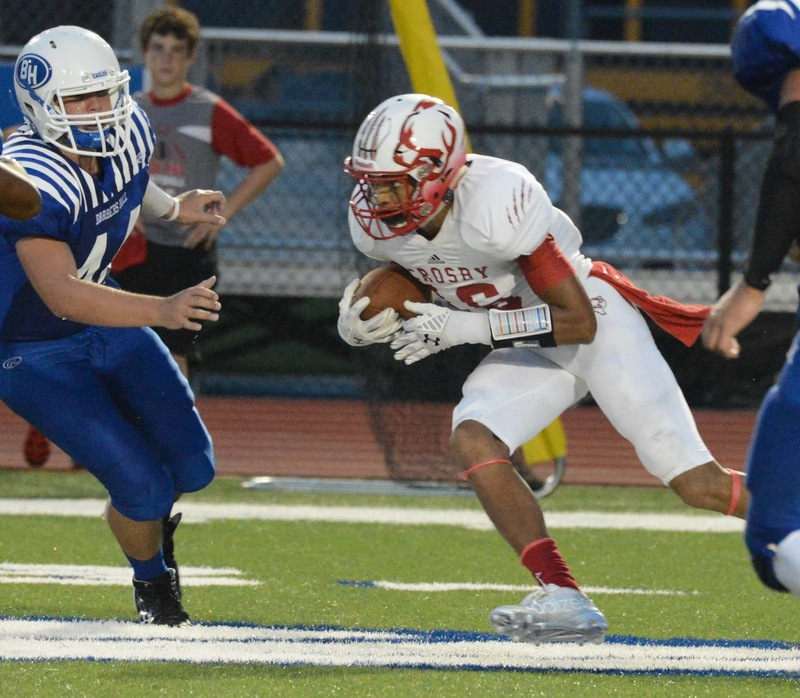 MONT BELVEAU, TEXAS (September 11, 2015) Paced by three touchdowns by wide receiver Manny Netherly, the No. 2 Crosby Cougars quickly outpaced Barbers Hill and downed the Eagles by the score of 40-21 at Eagle Stadium in the Houston suburb of Mont Belvieu, Texas on Friday, September 11, 2015. With the win, the Cougars go to 3-0 on the season and 1-0 in District 21-5A play while the Eagles fall to 1-2. 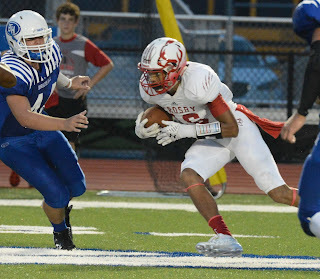 Netherly caught five passes for 138 yards in route to his three touchdown game, the best of the season for the 6-1 junior, and raises his count to six TDs for the 2015 season. He first reached the end zone at the 3:44 mark in the first quarter on a four-yard pass reception from quarterback Tristan Cotton. He added his second score of the game with 5:45 remaining in the first half as a result of a 65-yard pass from Cotton. He rounded out his scoring onslaught with a 50-yard pass, again from Cotton two minutes later. Cotton finished the game competing 21-of-32 passes for 360 yards and four touchdowns. He was intercepted once. The Cougars got on the scoreboard first after four minutes, 46 seconds of play when senior running back Sherman McGee carried the ball the final six yards into the end zone for the score. Jesse Vargas added the kicking extra point, as he did for all the Crosby touchdowns of the night. Barbers Hill quickly answered the McGee score with a touchdown of their own, on a one-yard run by senior running back Hunter Gobert. Marco Castillo tied the score at seven-all with the first of his three extra-point kicks. 360 yards against the Barbers Hill Eagles. 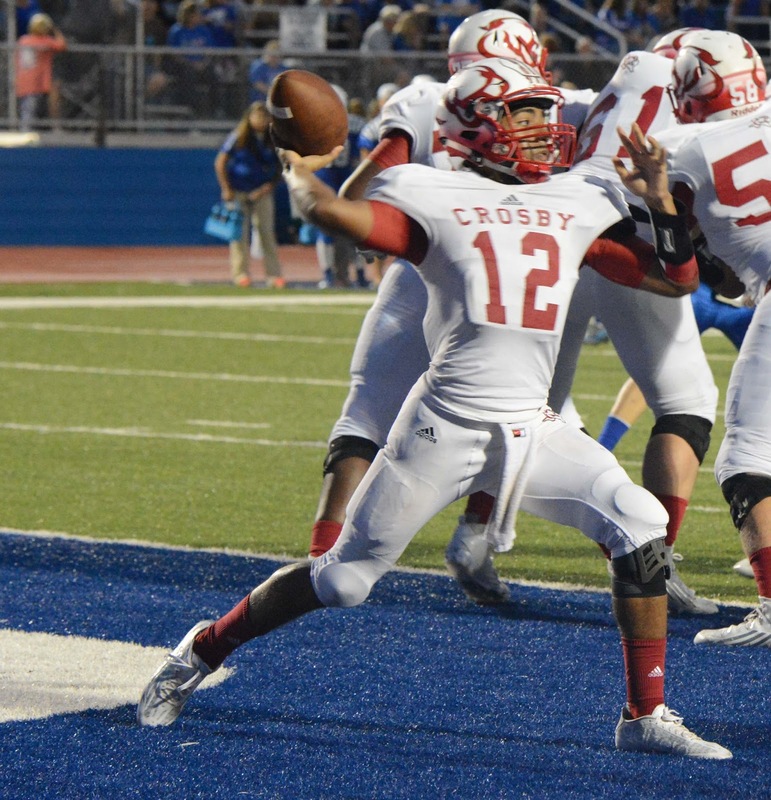 Crosby followed up with two of Netherly’s scores before Barbers Hill again found the end zone for their second score of the game; a two yard run by junior running back Cameron Hendricks. Netherly’s third TD follow before the Eagles scored on another Hendricks run, a five-yard romp with 37 seconds remaining in the first half. Both teams headed to the locker room at halftime with Crosby holding a 28-21 lead. The Cougars added two insurance scores in the third quarter on a 54-yard run by junior wide receiver Terryl Wiley at the 10:45 mark in the third quarter and a five yard pass from Cotton to senior wide receiver Shane Hudson. Crosby opted from the two-point conversion and failed on the attempt. Crosby accounted for 532 yards of total offense against the Eagles, with 360 if the yards coming from Cotton’s aerial attack. The Eagles posted 248 yards of total offense, with 186 yards coming on the ground. The physicality of the game was evident with the officials throwing their flags 14 times with 118 penalty yards assessed to both teams. Barbers Hill will next face the 1-2 Dayton Broncos on Friday, September 18, 2015 with a 7 p.m. CDT kickoff at Bronco Stadium in Dayton. 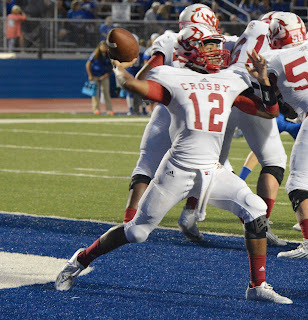 Crosby will face the Humble Wildcats at Cougar Stadium on Friday, September 18, 2015 in a 7 p.m. CDT contest. 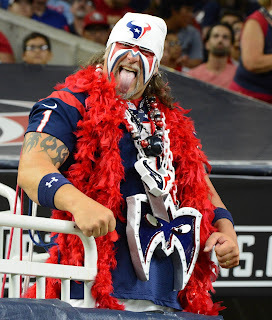 DALLAS, TEXAS (September 7, 2015) In their final pre-season game of 2015, the Houston Texans came up short against in-state rival Dallas and fell to the Cowboys by the score of 21 -14 at Cowboy Stadium in Irving, Texas on Thursday, 3, 2015. The game saw mostly unknown and last chance players on the field vying for a sport on the final roster for both teams. The Texans went up 7-0 in the second quarter when quarterback Tom Savage threw a short right pass to Chris Polk for 16-yard touchdown. 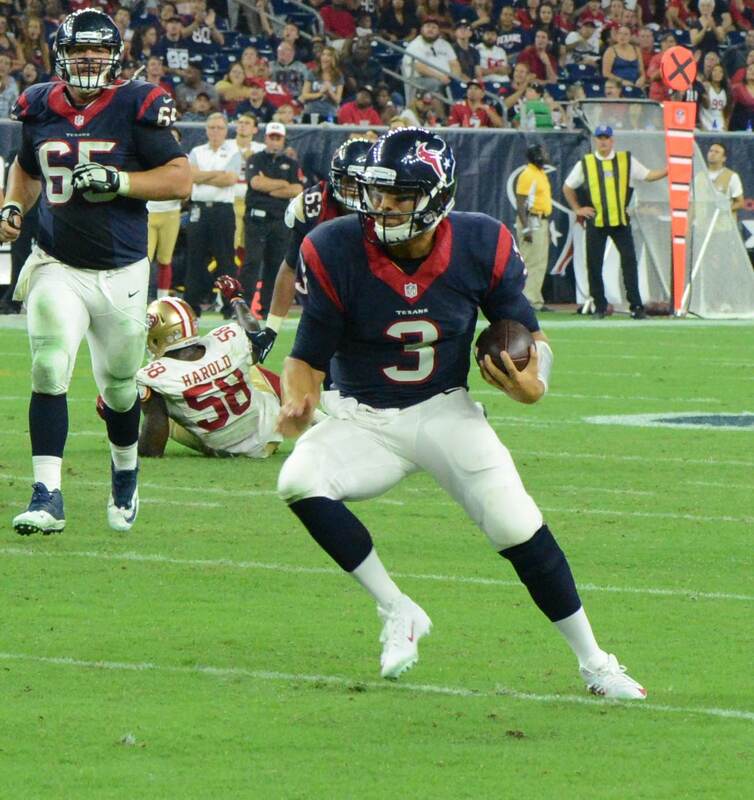 Randy Bullock added his obligatory extra point to close out the first half scoring. Polk caught four passes for 37 yards and carried the ball 10 times for 24 yards. The Cowboys answered the Texans score at the 11:39 mark of the third quarter when Savage was picked off by cornerback Corey White. Savage’s pass was intended for Jaelen Strong and was returned three yards for the Cowboy score. Dan Bailey split the uprights to tie the score. Dallas added seven more points 46 seconds later on a Gus Johnson 21-yard touchdown run. The score was bittersweet for Johnson as he was cut by the Cowboys on Sunday, September 6. The Texans added a 16-yard touchdown pass from Savage to Keshawn Martin and a Bullock extra point with 11:49 remaining in the game. Seven minutes later, Savage was attempting a short pass to the right side to Kenny Hillard. The pass was incomplete and Savage was hit by Cowboy defensive tackle Davon Coleman, suffering a shoulder sprain. He will be out for several week. The Cowboys added another seven points in the fourth quarter. 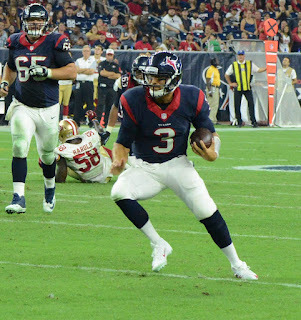 The win was the only victory of their pre-season while the Texans posted a 2-2 mark. The Texans will kick off their 2015 regular season schedule on Sunday, September 13 with a 12 noon CDT match-up against the Kansas City Chiefs at NRG Stadium in Houston. 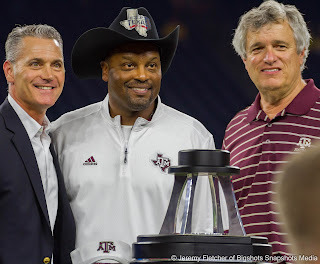 HOUSTON, TEXAS (September 5, 2015) The Arizona State University Sun Devils began the 2015 football season at NRG Stadium, formerly Reliant Stadium, in Houston, Texas against the Texas A&M Aggies. This was the first meeting between these teams, ending in a victory for the Aggies by a score of 38 - 17 on Saturday, September 5 in front of 66,308 screaming fans. Scottsdale natives Kyle Allen (sophomore quarterback) and Christian Kirk (freshman wide receiver / punt returner) contributed to four of the five touchdowns for the Aggies in the win over the Devils. 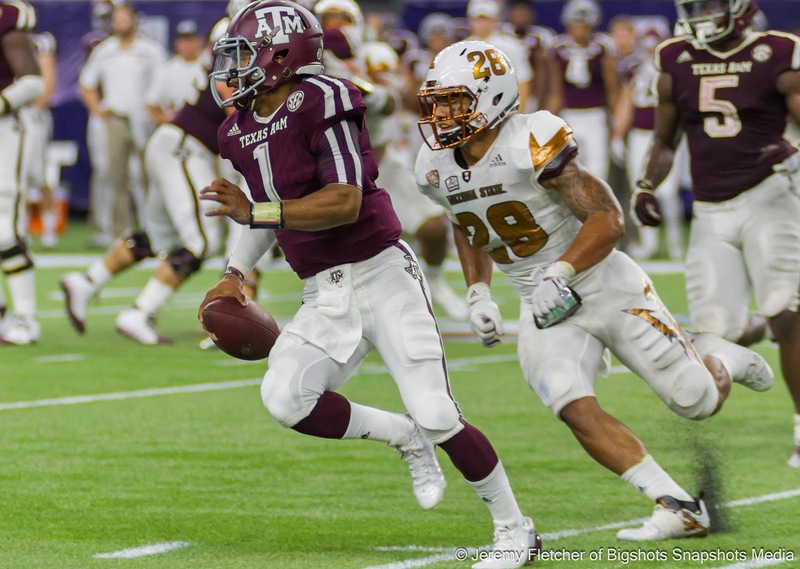 Allen put the Aggies on the board first when he threw a nine yard touchdown pass to Tra Carson, senior running back from Texarkana, Texas, in the first quarter for his first touchdown of the year. In the 4th quarter, he scrambled for a 12 yard touchdown. With less than four minutes left in the game, he connected with Kirk on a 66 yard touchdown to put the Aggies up 31-17. Allen finished the night with a 139.4 rating - completing 15 of 26 passes for 198 yards, two touchdown passes, one interception, and one rushing touchdown. Kirk was electrifying as he darted through the Devils' special team on a punt return for a 79 yard touchdown in the second quarter. Kirk ended the night with 106 yards receiving and 82 yards in punt returns. His two touchdowns were the longest plays of the game. Devils' senior quarterback Mike Bercovici threw a four yard touchdown to tight-end Kody Kohl for the Devils' first score of the night. In the third quarter, Bercovici ran for a 19 yard touchdown bringing the Devils' within three for a score of 17-14. 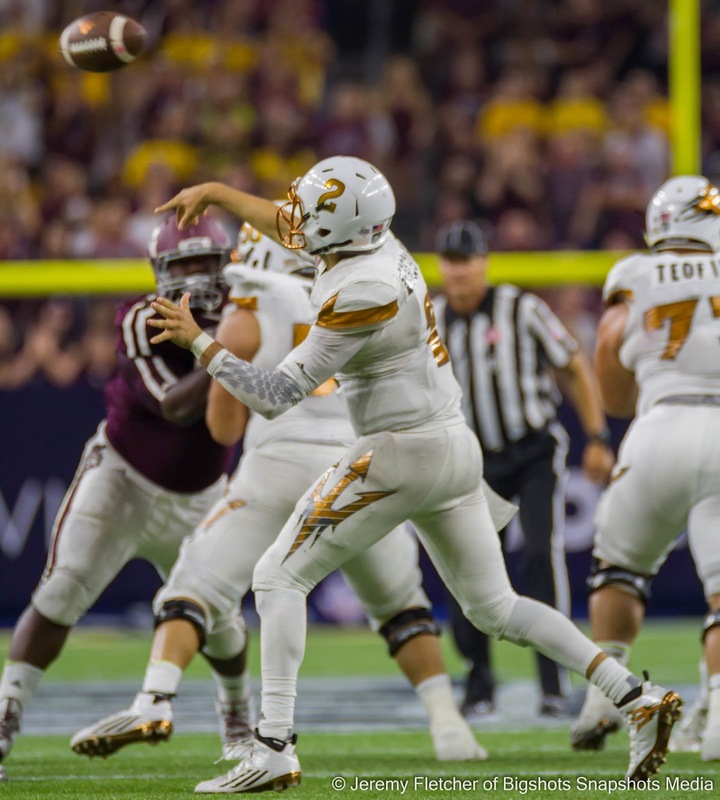 Bercovici would finish with a 109.8 rating, completing 25 of 41 passes for a total of 199 yards, one touchdown pass, and a rushing touchdown. 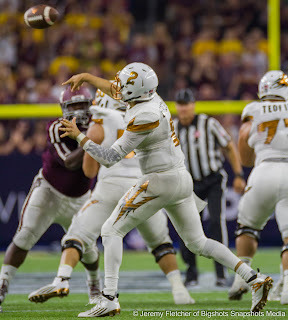 The Devil's only other points came from field goal kicker Zane Gonzalez, from 23 yards out with 4:16 left in the game. He finished the night with two extra points for a total of five points for the Devils. Aggies’ kicker Taylor Bertolet connected for a field goal in the third quarter from 19 yards out. He finished the evening making every extra point bringing his total to eight points. The Aggies' defense was able to get to Bercovici for a total of nine sacks on the night, four coming from defensive end Daeshon Hall, a junior from Lancaster, Texas.The final score of the game occurred with 1:38 left when Carson ran 10 yards for a touchdown giving them a 38-17 lead. The Aggies, who are now 16-0 against non-conference teams since Kevin Sumlin became head coach, will be hosting Ball State in College Station for their home opener on September 12, 2015 at 6 p.m. MST. The game will be televised on ESPNU and radio coverage can be heard on TAMUSN. The Devils, who have had back to back ten win seasons under Coach Todd Graham, will host Cal Poly in their home opener in Tempe, AZ at 8 p.m. PST. This game will be televised on Pac-12 Networks.